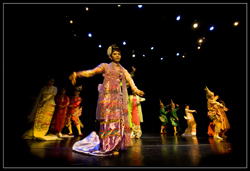 Lotus's Burmese Ramayana, choreographed by U Win Maung, March 2008 at the Hudson Guild Theater, NYC. Photos by Peter Kloprogge. 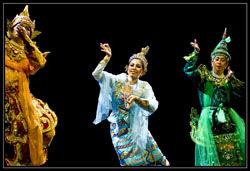 Burmese Dance comprises folk and classical elements corresponding to the varied forms of Burmese music. Burma's dance styles were originally influenced by neighboring cultures (Thai, Chinese and Indonesian) and its theater forms by the staging of Buddhist stories and propitiation ceremonies of spirit cults. Both genres developed distinctive forms in response to the country's rich cultural and religious mix and to changing political circumstances. The dance and music together create an ornamented, shimmering and exciting effect for the audience. There are smooth, graceful dances and livelier, more angular ones choreographed to playful but complex melodies where musicians carry on a dialogue of improvisation, which is in turn matched by the dancers, either in a group or as soloists.